The pillow that shimmer and glitters. Shimmer Pillow the pillow that shimmers and glitters. Just run your hand in one direction it shimmer, run your hand the other direction and it glimmers. Simply brush your hand across the pillow to reveal the secret color. As seen on TV Shimmer Pillow&apos;s fun is endless. Express yourself with Shimmer Pillow. 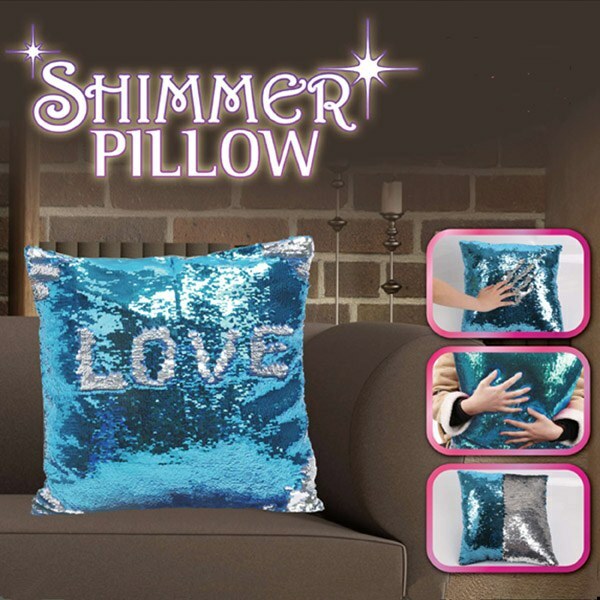 The Shimmer throw pillow is soft and cuddly stuffed with plush fill adding comfort to its charm. All ages love the sequin Shimmer Pillow. 17"x17". Sewn closed. Faux-suede backing. Polyester fabric and fill.